Behold the purple wonder – as my kiddos have dubbed it. 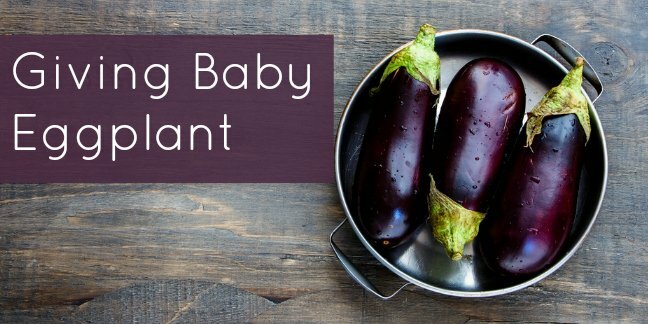 On this page you’ll learn about eggplant and try some yummy eggplant baby food recipe ideas too. While the eggplant is not a nutrient packed powerhouse, it does contain a great amount of Vitamin A and Folate. Eggplants contain fiber, a very important part of any diet as fiber helps maintain bowel regularity. Eggplant also contains a wonderful amount of calcium and even some Vitamin K.
Also contains small amounts of selenium, manganese, copper and zinc. According to the EWG, eggplant is not one of the “dirty dozen” foods that are most highly contaminated with pesticides – purchasing organic is a personal choice. Eggplants should be firm and a bit heavy. Choose only those eggplants that have smooth and shiny skin. The color, no matter which color you purchase, should be very vivid. An eggplant that is discolored or has scars and bruises is not a good choice. These blemishes may indicate that the flesh inside the eggplant is damaged or even decaying. Store eggplant carefully in the refrigerator; eggplants are a delicate vegetable. For longer storage, only cut the eggplant when you are ready to cook or otherwise use it. When cooking eggplant, you may either steam, fry/sautee, or bake it. Steaming it may be the best method if you plan on serving eggplant to your baby. Steamed eggplant tends to become very soft and tender (and sometimes mushy) so it makes a great finger food too. Step 2: Cut into 1 inch pieces and steam until tender and mushy. Step 3: OR slice eggplant in quarters and bake in a 375 degree oven for approx. 30 minutes or until tender. Step 4: Place into your choice of appliance for pureeing and begin pureeing. Step 2: Slice eggplant in quarters, brush with olive oil and sprinkle with a small amount of basil. Bake for approx. 30 minutes or until tender. Step 2: Saute onions in olive oil over medium-low heat for 5 minutes. Be warned that cooked eggplant looks rather ugly – it changes into a greyish color that may put you off but this is normal.